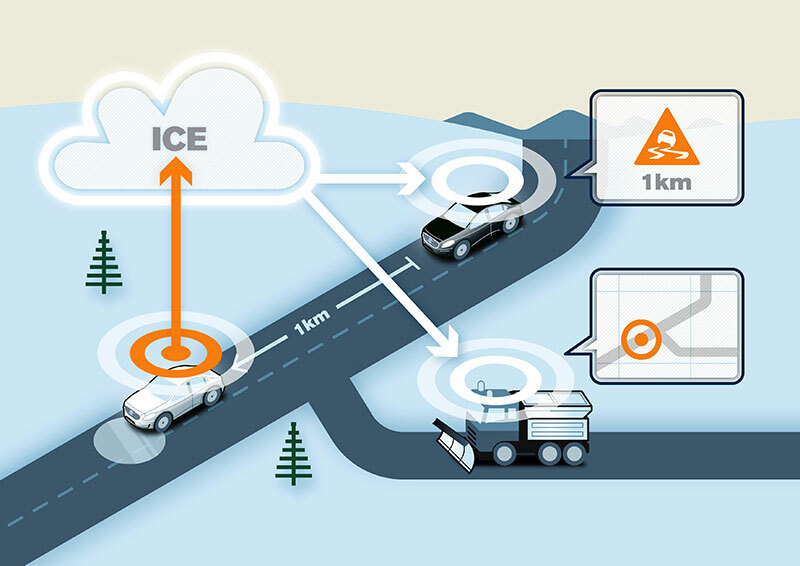 Volvo Cars, the Swedish Transport Administration and the Norwegian Public Roads Administration are working together on a project to enable cars to share information about conditions that relate to road friction (such as icy patches). The information will be shared through a cloud-based network – a revolutionary approach to improving traffic safety. And with the test fleet now expanding from about 50 cars to 1000, the project is moving rapidly towards its goal of making the technology available to customers within a few years’ time. “The more information that can be shared on the road, the fewer surprises there are. And when you’re driving, surprises are what you most want to avoid,” says Erik Israelsson, Project Leader Cooperative ITS (Intelligent Transport System) at Volvo Cars. “In light of that, we’ve developed a slippery-road alert, which notifies drivers about icy patches and contributes to making winter road maintenance more efficient. We’re also adding a hazard-light alert, which will tell drivers if another vehicle in the area has its hazard lights on. With these first two features, we have a great platform for developing additional safety features. This is just the beginning,” Erik Israelsson continues. And the research project is getting closer to real-world implementation: with the technology in place, the testing and validation phase is now about to begin. In this phase, Volvo Cars will both expand the test fleet 20-fold and broaden the test area to include two big Scandinavian cities: Gothenburg and Oslo. Together, these measures will provide a more complete picture of how the system will work in real winter traffic conditions. The slippery-road alert also sends information about icy patches to road administrators as a complement to existing measurement stations along the road. The data can help road administrators and their contracted entrepreneurs to better plan and execute winter road maintenance and quickly address changed conditions. In addition, the Norwegian Public Roads Administration will conduct an independent assessment of the system to identify additional uses for the data in aiding future winter road maintenance. Volvo Cars strategically invests in and initiates partnerships to create cloud-based solutions. 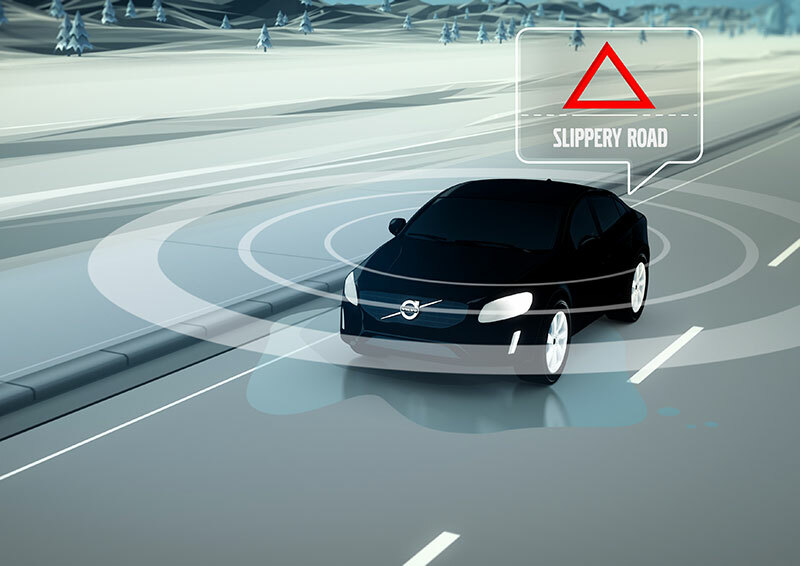 The hazard-light and slippery-road alerts are the first safety features in the Volvo cloud. The development of sophisticated communication via the mobile network is part of the company’s aim to offer customers a fully connected experience. “In the future we will have increased the exchange of vital information between vehicles, as well as between vehicles and infrastructure,” says Erik Israelsson. “There is considerable potential in this area, including safer traffic, a more comfortable drive and improved traffic flow,” he adds. “This will bring us closer to our safety vision that by 2020 no one should be killed or seriously injured in a new Volvo car. And it’s another way in which the ‘Designed around you’ philosophy improves the driving experience,” concludes Erik Israelsson.